large print | 22 Point Blog! The quick recommendation: What works best in one app, doesn’t necessarily work best in other apps, so the best solution is one which can be adjusted easily. Font size is easy to adjust and effective. Pixel density can also be effective in some cases. Recently I’ve tried rooting my phone and installing a custom ROM. More on that in another post shortly, but one of the big reasons I was keen to try this, is that it gives you access to settings you can’t otherwise touch and I wanted to see how I could manipulate these to increase the large print useability of my phone. My previous post on DPI (Pixel density) and resolution on a Windows PC (here: https://22point.wordpress.com/2014/08/13/resolution-vs-dpi/) has some explanation of the technicalities, which mostly translate across to a phone. On the PC I recommended setting he resolution to its highest, the DPI high and using the magnifier as needed beyond that, but I’ve never been a fan of using magnification on my phone if I could avoid it as the screen is so much smaller and more fiddly to pan around with my big fingers! Resolution: This is how many pixels (dots) wide and high the screen is. 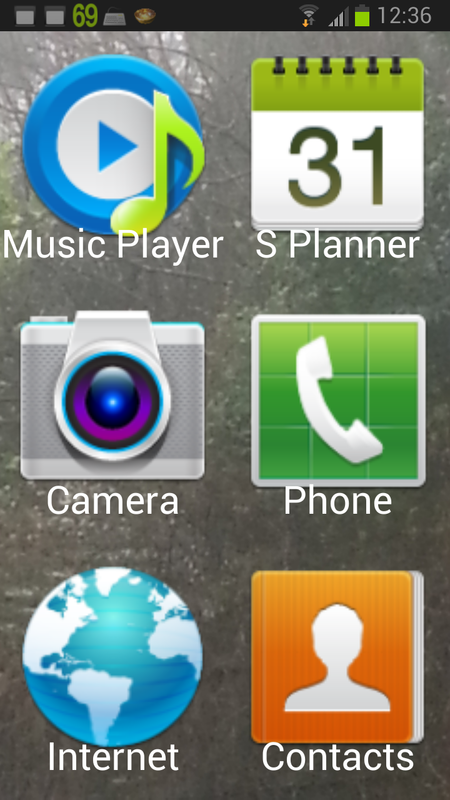 On my Samsung galaxy note 2 for instance, it is 720 x 1280. Theoretically, lowering these numbers could make things appear larger as something which is 180 pixels wide will take up ¼ of the width of the screen at this resolution, but if I drop the resolution to 360 x 640 then that 180 pixel wide item is now half the width of the screen (that’s how it works on a Windows PC). Pixel Density: (often used interchangeably with the terms Pixels Per Inch, PPI and Dots Per Inch, DPI) This is how many pixels are displayed in a line per inch of screen space – From a hardware perspective, the higher this number, the sharper and clearer the display looks. Adjusting this higher than the hardware specifications has the effect of enlarging things. If your phone has an actual hardware Pixel Density of 200 and you change the pixel density setting to 400, something which should be 1” high will be drawn 400 pixels high, but because your phone can actually only display 200 pixels to an inch, that object will render at 2” high. 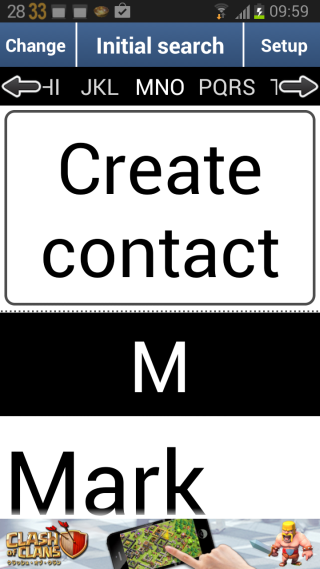 Font size: I’ve covered apps which let you change font size before (here: https://22point.wordpress.com/2013/08/30/android-font-enlargement-apps/ ) and this time I’m looking at the effect that adjusting font size (along with resolution and pixel density) has on the useability of apps. 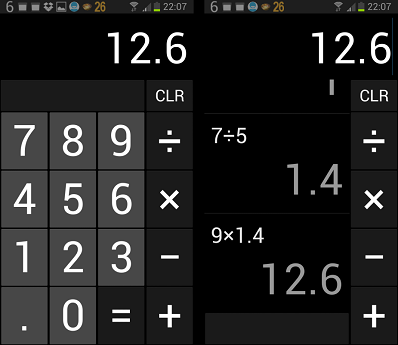 Control: The native resolution (720 x 1280) and pixel density (320) of my phone at standard font size. Most adjusted: A lower resolution of 450×800, higher pixel density of 400 and font size at 200%. Slight tweaking: Native resolution, 150% pixel density (480) and 150% font size. High DPI: Native resolution but double pixel density – 640 rather than 320, standard font size. Large Font: Native resolution and pixel density but 200% font size. The “most adjusted” setup was designed to affect the most parameters and so be more likely to have an effect (one way or the other). The “Slight tweaking” setup was designed to be a potentially practical solution which didn’t adjust any value too harshly, but provided a combination of effects which would hopefully be beneficial. Resolution: Changing the resolution had the least effect in most cases. It turns out that most apps seem to be designed to draw things as a percentage of screen size so this didn’t make any difference to most things. Pixel Density: Changing the pixel density tended to make things bigger, from the status bar to the size of icons and information within apps. Some apps handled this well and it was a great improvement and other apps, particularly some of the games, became unusable. 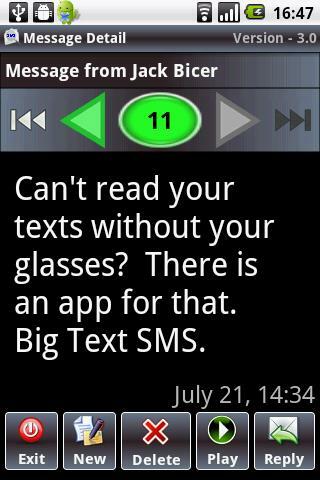 Font size: Changing the font size increased the size of text in many apps. Often this made the text easier to read, however in some cases the text was then bigger than the app was expecting and so overwrote other information or caused things to disappear off the side or bottom of the screen. Some apps displayed exactly the same regardless of how I changed settings. In one way this was good as it meant that they were not negatively affected by any of the changes, but on the other hand it meant that I was not able to come up with a way of improving their large print readability beyond any settings in the app itself. Leaving things untouched was the equal best case in 39% of apps and the equal worst setup in 89%. It was possible to adjust the pixel density, resolution or font size such that there was an improvement in 83% of apps, and in only 16% of apps, some combinations of changes caused a negative reaction. The two biggest improvements here were in adjusting the font size (better in 71% of cases and worse in only 2%) and pixel density (better in 70% of cases and worse in 9%). While the slight tweaking scenario was only the best case in 3% of apps, this was mostly because there was an improvement (79% of apps) however it wasn’t as marked as when we doubled the DPI or font size. This setup was only worse than doing nothing in 6% of apps. Adjusting the resolution had the least effect here – it was the same in 98% of cases (worse in one and better in one). The default setup was the equal best setup in 78% of cases and the worst case in only 12%. Only 22% of games could be improved by adjusting the settings and 39% of games could be made worse or unusable with the wrong setup. Similar to the non-game apps, lowering the resolution all the way down didn’t change anything for 93% of games though in 73% of cases this was still equal to the best setup. Adjusting the font size made 15% of games better and one worse and was the (equal) best setup in 77% of cases. Changing the pixel density (and thus also the two combined scenarios) actually made things worse more often than better – not so much for font size alone, but just because some of games weren’t designed to cope with such an adjustment and only improved things for between 12 and 17 games but made things worse for between 14 and 35 games. 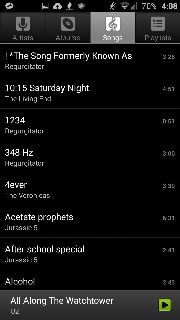 Above: The music Cyanogenmod music app, in the default resolution / pixel densit, in the most adjusted setup and in the slight tweaking setup. Adjusting the pixel density seemed really good for many productivity based apps, but can be detrimental to some of the games. Adjusting the font size seemed overall to have the most positive effect with the fewest negative situations. In an ideal world, the best solution would be if there was a way of quickly changing the font size and pixel density for different situations. In my testing, I used an app called “Font Size Setter” by Cedric Gatay (https://play.google.com/store/apps/details?id=fr.gatay.android.fss) , to adjust the font size setting. I found this app good as the interface is basically just a slider you adjust to choose the size and an apply button which immediately makes the change. I also placed a shortcut to Font Size Setter in my notification shade using Custom Notifications, which made it even easier to bring up. I used Resolution Changer by Lugalabs (https://play.google.com/store/apps/details?id=com.lugalabs.resolutionchanger) to adjust the DPI and resolution, and the way this worked was that after making the change, the screen would flicker, and then take you to the phone’s lock screen. During this time it also displayed a message asking if you wish to keep the changes and giving you 15 seconds to agree before going back to the old setting (similar to when you adjust the screen resolution on a Windows computer). While effective and potentially a safeguard in the event of choosing a setup your hardware could not display, I did find that this process took a little while, and I would be reluctant to want to change DPI too frequently. If there is another app which does the process more easily I would be very excited to learn of it. With most of my previous recommendations, it’s been possible to choose one or several apps or setups which work best to achieve a particular outcome. 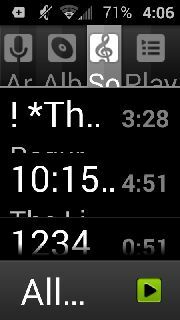 With adjusting the display properties with the goal of making the font larger, there isn’t one recommendation which will work for everyone. Some apps respond great to some tweaks, whereas others become unusable, and depending on what apps you use, you will likely find that what works in one app, doesn’t work in another. For myself, I’m still using the slightly higher DPI mode though I tend to leave my font set at 200% except where this causes problems, but at least I can easily adjust the font size back. There are a few (games) I won’t be able to play in this setup, and a couple more I can play by adjusting the font size, but overall it’s definitely an improvement on the stock experience. Adjusting the font size using an app like Font Size Setter is the easiest and quickest way of getting an overall larger font, and easy to turn off if needed. Changing the DPI can have more of an effect in some places (eg the status bar) but doesn’t work in some apps and can be a longer process to change back and forth. What works best for one person and one app, won’t necessarily work across the board so it’s a matter of trial and error to find the best setup. What setup have you found that works best for you personally? Please let me know! 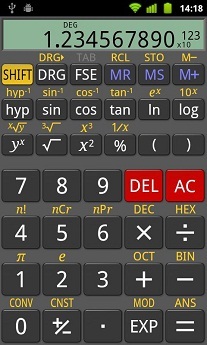 The quick recommendation: DarkCalc and Cyanogenmod both have the option of a basic or scientific calculator view with large text and which are Talkback accessible. 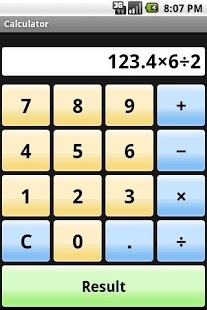 A calculator is one tool which is quite handy to have and which everyone has their own ideas on what they need from one. 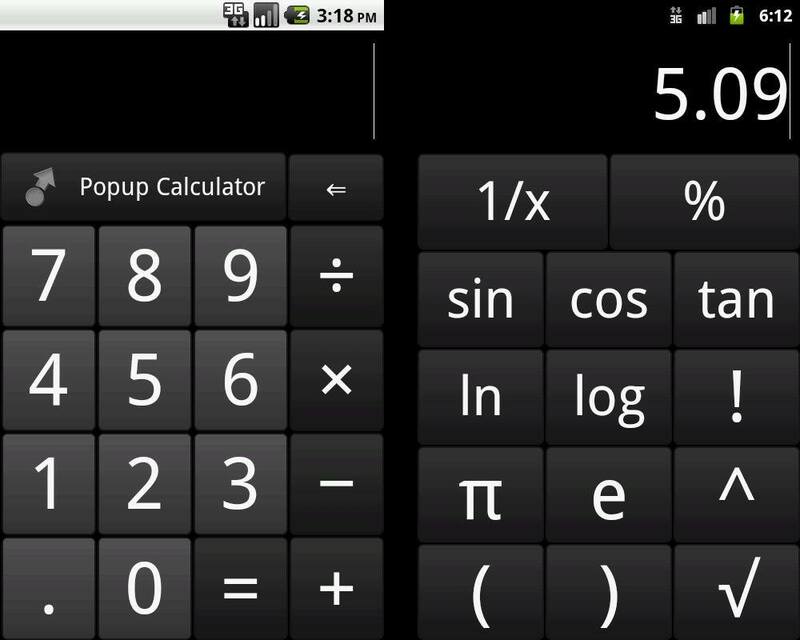 Most devices come with a calculator app but some are better than others for large print and Talkback accessibility so I’ve rounded up all the ones I could easily find on the Play Store which don’t need Internet access and put them through their paces. I’ve put together a table of the main accessibility features of each sorted by (smallest) font size, and then listed each of the apps. Two screenshots: Left showing initial view. Right showing scientific screen. Buttons 60pt. Basic with scientific functions and history. Buttons and result, 26pt, buttons brightly coloured. 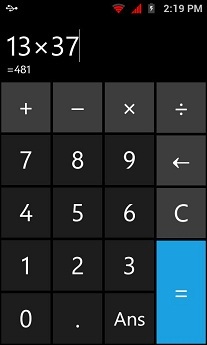 Very basic function calculator, no history or memory. Buttons read with Talkback but do not work. Dev email bounces. Numbers 28pt, result 26pt, functions 22pt. Black or white colour themes. 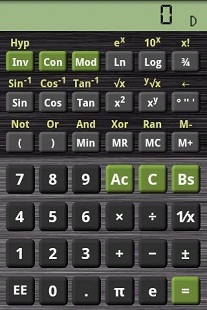 Basic and Scientific calculator with graphing, history and simple layout view. No “memory” buttons but can reuse history results. Graph and a couple of buttons unlabelled but pretty much everything reads well with Talkback. 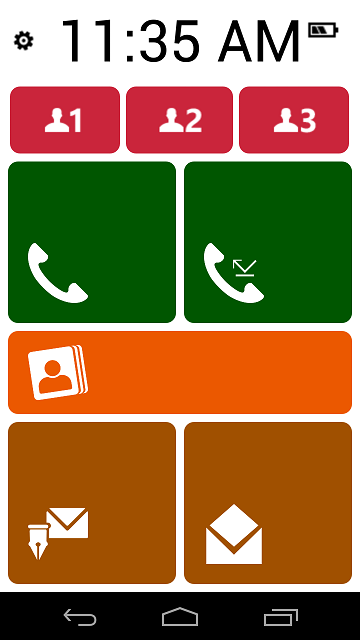 Widget and colour themes. Numbers and result 22pt. 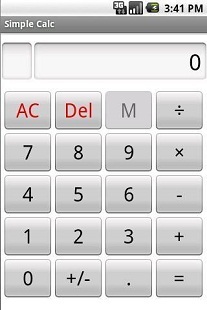 Basic calculator, buttons black on grey with white or black background. 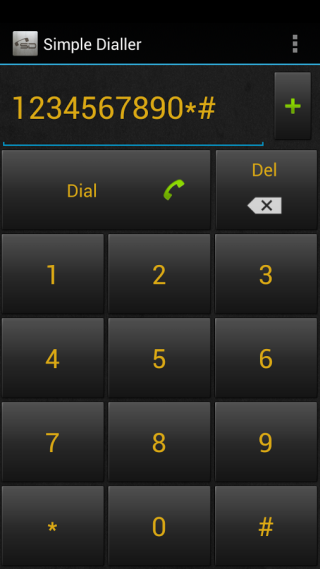 Does not work with Talkback (Numbers read, but pressing numbers appears to activate the “Del” button). Buttons 18pt, result 28pt. 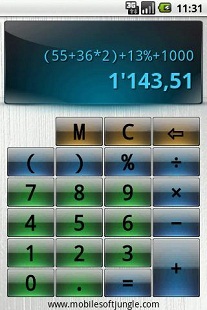 Basic calculator (widget only) with memory. 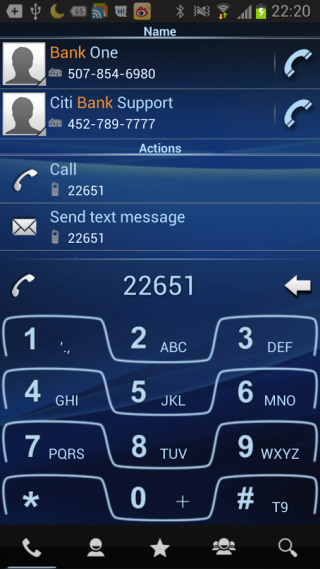 Works with Talkback although bottom row with 0 . and = buttons not visible on my Galaxy Note II. Numbers 20pt, functions 18pt, result 48pt, current calculation 16pt. 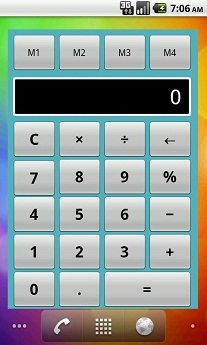 Basic calculator with memory, works with Talkback, buttons have 3D effect, which I find a little harder to see. Buttons 24pt, Result 20pt, current calculation 16pt. Numbers 20pt, functions and results 16pt, some scientific functions. Buttons are white on colours (grey for numbers, blue for functions, red for clear / del, green for memory and purple for advanced functions). Works with Talkback. Function buttons visually appear to stick down when pressed but behave as expected. Buttons read with Talkback, however results and Graph not readable with Talkback. 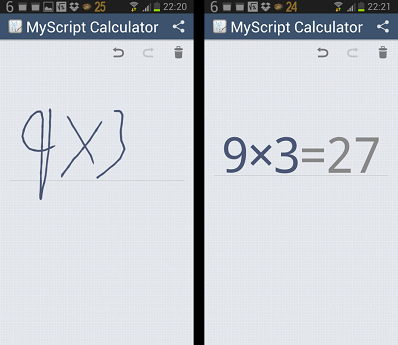 Two screenshots showing Left: My very poorly hand drawn calculation and Right, the correctly interpreted numbers and symbol. Font size for writing starts at about 48pt but decreases in size as calculation gets longer. 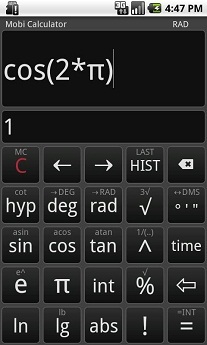 Scientific calculator, Handwrite numbers, operators etc on screen instead of buttons. Seems to do a good job recognising input. Does not work with Talkback. 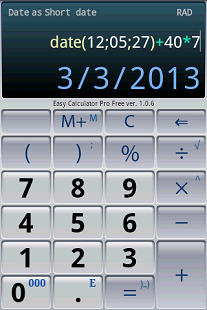 Basic or scientific calculator with memory and history. Does not work with Talkback. 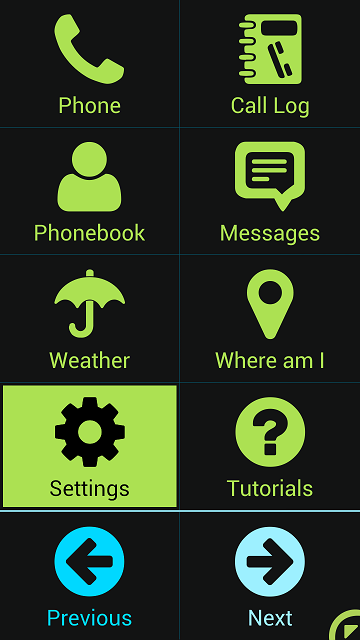 Buttons are white on dark grey, alt functions yellow on dark grey, results black on LCD style green. I do like that it can convert lengths / weight / speeds / all kinds of things. Does not work with Talkback. Appears over the top of other apps, only takes up a small amount of my screen and partly transparent so hard to see. 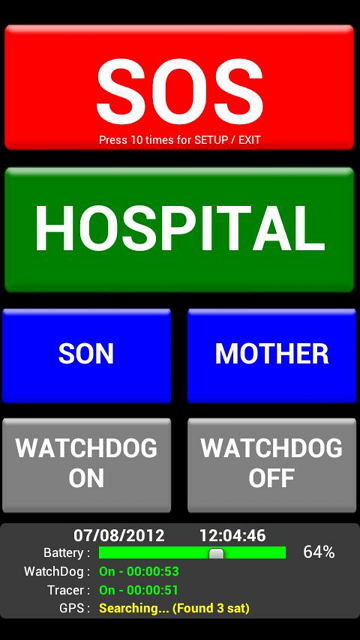 Works with Talkback only by explore by touch, no swiping, image buttons unlabelled though numbers, operators and results read automatically. I actually never found the scientific features until I lookied on the play store for an image to use above! Buttons and results 24pt, history 10pt. 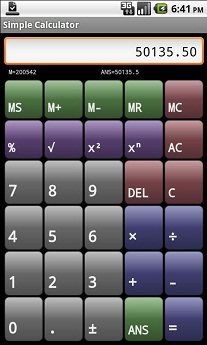 Basic calculator with memory, works with Talkback. Widget and colour themes. Buttons and result 22pt, current result / formula, 10pt. 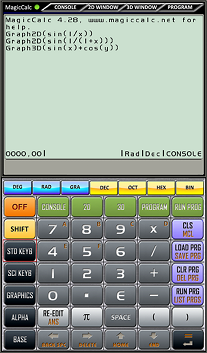 Basic calculator with no extra functions, works with Talkback. 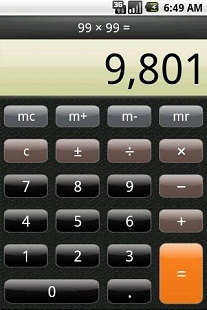 Actually a good basic option, only dropped in the list because of the small font for showing the current formula. Numbers 20pt, functions 10 pt, results 26pt. 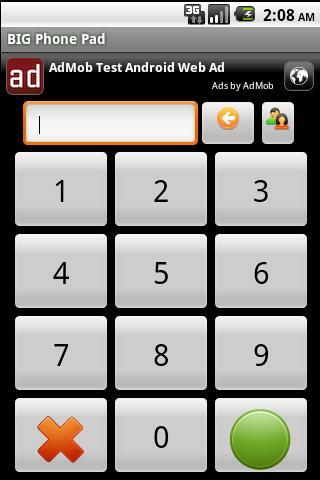 Scientific calculator, does not work with Talkback. Numbers 16pt, functions and screen 8pt. 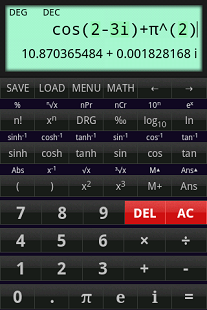 Scientific calculator, does not work with Talkback. 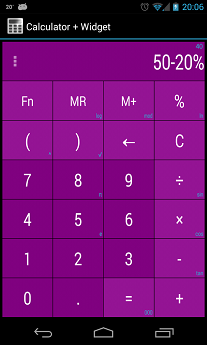 Basic or Scientific calculator with history and memory. Buttons do not work with Talkback, though results and history do read. 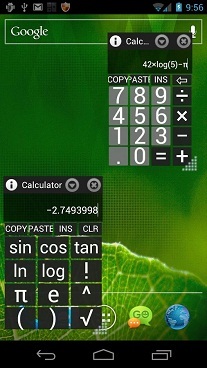 There are a range of basic and scientific calculators available with large fonts and I quite like how in several such as Cyangenmod and DarkCalc you are initially presented with a basic view, but can swipe to the side to bring up extra optons which gives access to all the features without cluttering up the screen. The quick recommendation: Big Font (paid version) or Font Size Setter are the biggest. 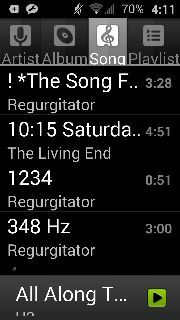 Android 4.0 and later have the option to adjust the system font size (Look in Settings, Accessibility, Font Size). The largest setting the operating system provides is “Huge” which is about 120% of normal. There are a number of apps on the play store which provide even more size adjustment and also provide the option for devices running earlier versions of Android. 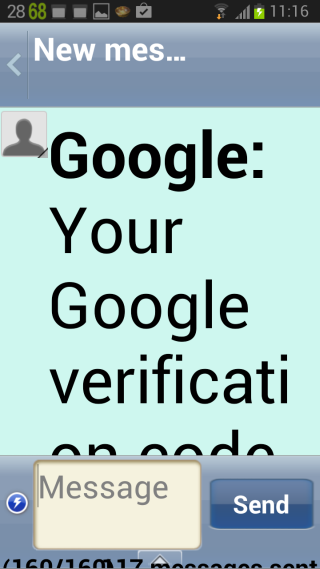 Unfortunately from Android 4.2 apps are not able to adjust the system font unless the phone is rooted. That is very unfortunate for low vision users particularly as 4.2 is the first version of Android to include a screen magnifier. The system font isn’t used in every app, but being able to adjust it can provide a significant increase in font size where it is used. I didn’t look at apps like Font size editor which require root. Summary: If you have a device running Android 4.1 or earlier these apps are definitely worth looking at. Note that if you have (or get) 4.2 or later they won’t work without rooting your phone. The quick recommendation: Lightning has more flexibility than Big Launcher, but not everything is large print. There are several launchers which were designed as lightweight, mainstream launchers, which just happen to have some large print features worth looking at. Lightning Launcher (Free, several free and paid add ons). Lightning was designed primarily as a lightweight launcher to work on any phone. It doesn’t have large print contacts or features like Big Launcher, (we can use other apps for this which I’ll cover in a future post) but you can zoom in on the home screen and you can set the all apps list to be a list with print as large as you like. The launcher works with Talkback, although when you’ve zoomed in, Talkback still finds icons in their original position (ie, in the top left quarter of the screen). Text in the setup menus for Lightning are 12pt and it can take a bit of extra tweaking compared to say EqualEyes. It does offer a lot of customisation and access to the full range of widgets. 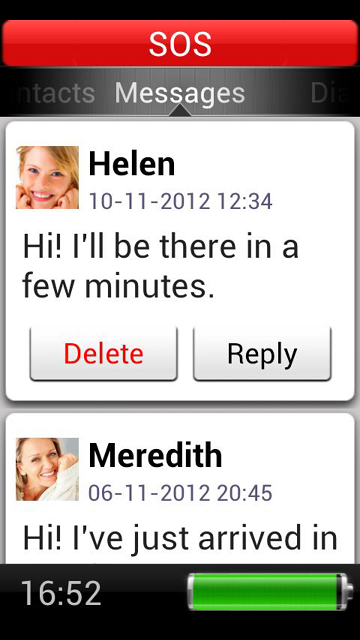 Tap the phone’s “Menu” button and choose “Customise Lightning”. Under “Zooming and Scrolling” ensure that “Enable pinch zoom” is checked. Under “Items”, set font size to 20pt (or whatever size you like). In “General”, “Events and Actions”, set something (I use Double tap on empty space) to “Zoom full scale”. Use the “Widget Options” of the “LL Widget” screen switcher widgets to add multiple pages. 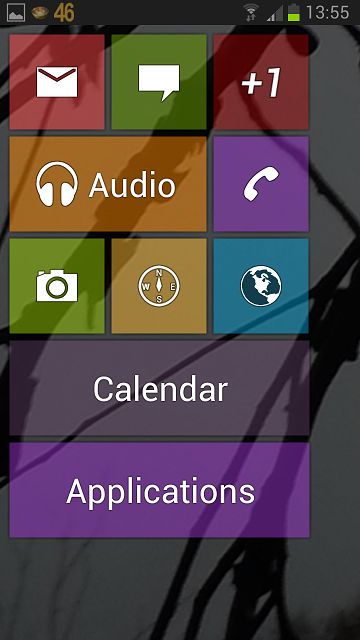 Setup your screen(s) with no more than 3 x 4 icons and double tap on a blank space to zoom in to maximise them. You could set the screen to 2 x 3 or even any other number but you might need to tweak the column and row size values from my suggestions above to fit). LightLaunch is another lightweight launcher. 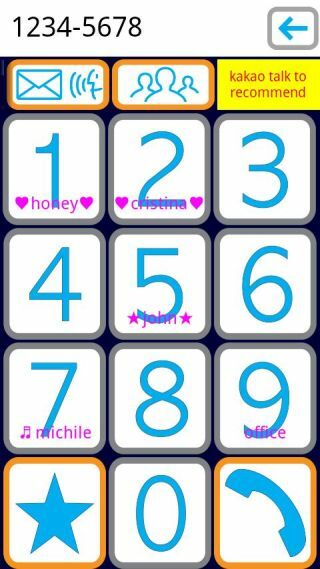 It gives you a simple grid of all your apps which you can scroll up and down through. You can set it up fairly easily to 2 column, 3 row, 200% size icons. 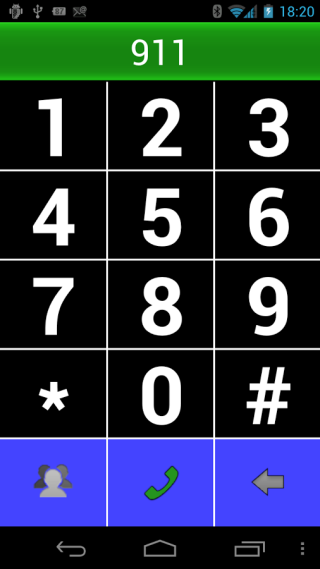 Like Lightning, it doesn’t provide a replacement dialer etc, so a 3rd party large print replacement would be needed. I couldn’t quite figure out the app sorting order, but you can hide apps from the list which is useful. 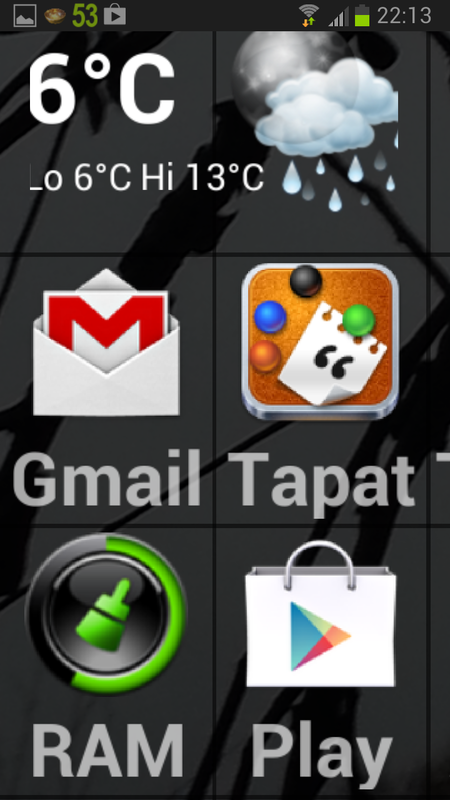 Font can be set up to 14pt and icons are up to 27mm high. Having large, scrolling icons is nice though lack of sorting is frustrating. Lightning is a good option if you would like a grid size other than 2 x 5 and bigger widgets, but not everything is large print like it is in Big Launcher. If you’ve found any other launcher options, please let me know. I thought I would deviate from my series on launcher options today to post two things about Talkback, the screen reader on Android for those who use it. One I quite like there is the automatic scrolling of lists, which has seemed a little disjointed previously. Now as you swipe through a list it will automatically scroll the page once you reach the last visible item. Talkback support for last week’s list of simplified launcher. 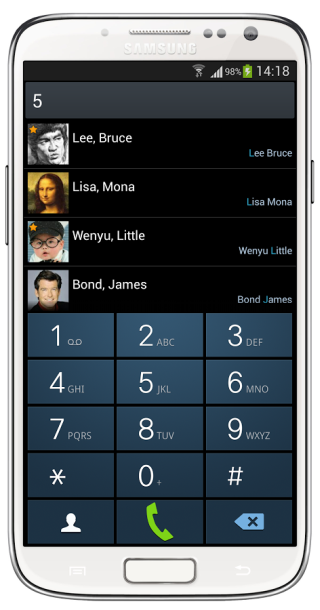 Phonotto simple phone – Buttons are listed twice when swiping with Talkback (once as simply “button” and once named correctly), otherwise seemed to work ok. 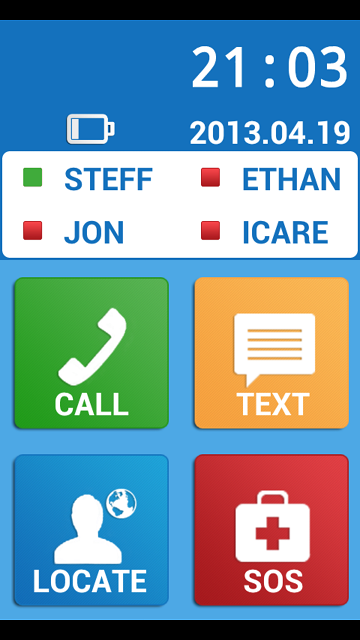 Phone for Elderly people – main buttons read, battery status etc don’t read. Coming soon I’ll be posting part 3 of my series on launchers, which will look at a couple of ‘mainstream’ launchers not specifically designed for large print users, but which can be adapted.